This time of year we all start feeling a little more greasy and our faces take on an unwanted shine. There are many products out there that can help keep this problem at bay, but Clinique has created a new little miracle that really does keep your skin grease-free while giving it just the right amount of hydration. 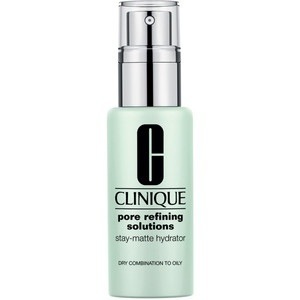 Clinique Pore Refining Solutions Stay-Matte Hydrator is an oil-free and non-acnegenic hydrator that instantly refines the look of pores with unique light-scattering optics and controls unwanted luster on your face. It controls oil and shine and your t-zone stays fresh and matte for up to 8 hours. Using this twice a day will give you a renewed appearance and your skin will glow, not shine. And that is just what I want and need during the hot summer months. Trust me when I say this will keep the shinies away. I suffer from oily skin and this does wonders. My skin looks radiant and comfortably matte.